Taking public transit? 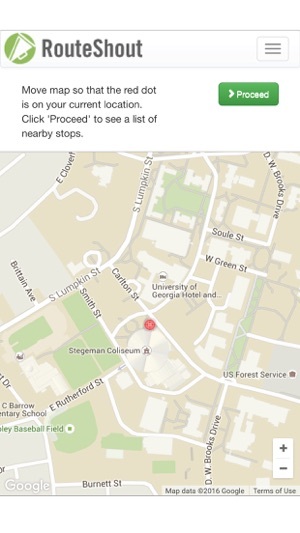 Download this free, convenient app to get real-time or scheduled next bus arrival times through your iPhone or iPad. The RouteShout app helps you be on time and prepare for changes - anytime, anywhere. 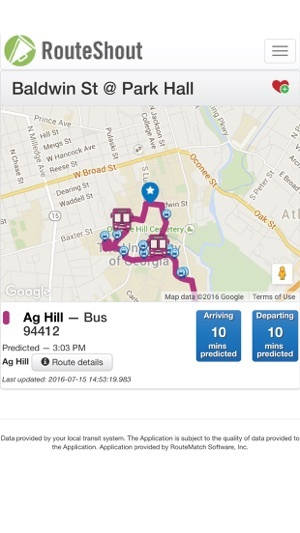 With RouteShout, you can know of bus delays and remove the uncertainty from taking public transit. Get to work, to your class, or that important appointment. 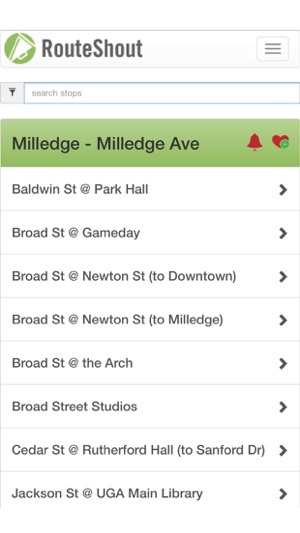 It's the handy, free app for locals, students, tourists and other public transit riders. Just select your agency and route, and off you go. • Know when your bus is on its way. • Cut down your wait time. 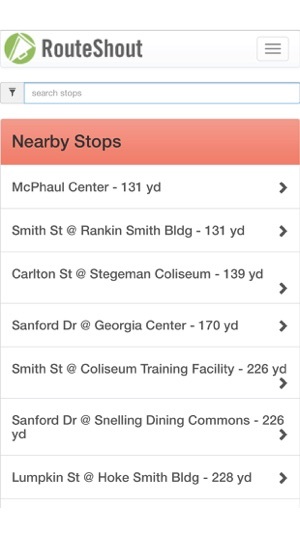 • Stay alerted of bus schedule or route changes, service disruptions or traffic delays. • Plan your journey and connections. • View bus routes and stops. • Choose and save your favorite stops. Try it today. If you like it, don’t forget to write a review- and tell your friends. Note: You may have limited access if data is not supplied to RouteShout from your local transit system. Data is provided by your local transit system. Application is subject to the quality of data provided to the Application. 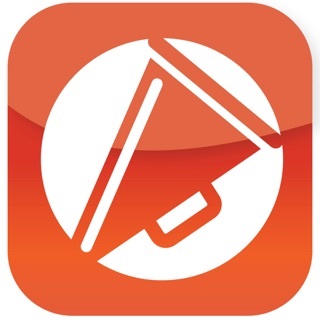 The Application is provided by RouteMatch Software, Inc. I am glad our local transit is using the app, but the interface is really clumsy and it’s overly complicated to quickly check where my bus is. This is my only option, since our bus system is rural and this is the only app that gets their data. If I did have a choice, I’d use something else. I feel like the people that made this software aren’t frequent bus riders and didn’t talk to anyone who is. The interface is slow. It takes many cumbersome steps to get to the information I need - scrolling and searching through a list of 30 routes, then a list of times (times for what - when the bus starts the route?! ), then about 70 stops named by street and intersection. It could make use of location services and make educated guesses about which bus our route I might be waiting for. I can favorite certain items, but even that isn’t useful. I can’t check to se when the “next route 1 bus gets to the place I am standing”. That would be the minimum helpful function of the app. 1. Predicted arrival time never shows more than a single digit once scheduled arrival has passed. Prediction not useful when a delay is 15-30 minutes or more. 2. Saving a stop found via “Locate Me” as a favorite is ineffective because recalling that favorite never shows any upcoming arrivals. Favorites only work when saved from Where’s My Bus it Schedule, which means a stop must have multiple favorites if more than one route serves that stop. 3. Navigating the embedded map is so hard it is common to end up zoomed out to show the entire planet. I use this app quite regularly because the busses in my city are unreliable sometimes. They're 15 minutes late, 10 minutes early. The app works decently for me. But is in desperate need of an update. There are severe loading issues and I'm not the only person in my city with this issue. Even the transit system themselves, the screens showing this app so we all know where the busses are, have been freezing up a lot in the last month. Needs updated. Badly. Routes need to load faster. The whole app needs to load faster. I'm on LTE and this app runs like dial up. 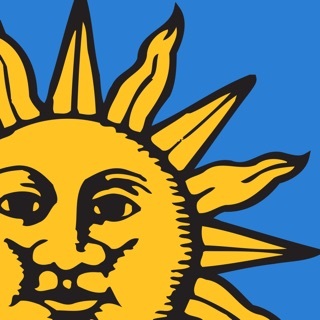 © 2016 RouteMatch Software, Inc.